Yesterday was back on track with OMAD and counting calories. Still drinking a ton of zero calorie pop and zero calorie energy drinks. Love the taste, but don't enjoy the way the large amounts of caffeine are making my head feel. Have around a case of my favorite high-caffeine cans left. Bought several 12-packs of zero calorie cans of caffeine free pop. Going to try switching to the caffeine free stuff after I run out of the heavily caffeinated cans and see if I can deal. Progress as of today: 91.9 lbs lost so far, only 32.1 lbs to go! Maybe alternate between caffeine and non-caffeine drinks, to balance it out. I've had that weird feeling when I've had too much caffeine --- just have to ride it out, as I do not know of a way to counteract the effects. Caffeine helps me feel focused, "up" and alert -- but too much tends to make me feel jittery and unable to focus. Strange how that works... too much of a good thing. And good for you for getting back on track as soon as possible. Keep trying with this. I love diet pop...but it makes my joints hurt for some reason...and it always has...even when I was young. i have 3 brands to choose from by me :) supposedly its VERY good for your body's PH levels. Thanks for the comment. It made me post a new entry. So the cruise was enjoyable. It was mostly relaxing and I didn't think about work much. It was good to sit down with most of the family every night at the formal dining. There were 16 of us (8 adults, 8 children), so we switched up where we sat each night. The wife and daughters really enjoyed dressing up each night. In the past I really haven't enjoyed wearing suits / tuxedos. This time I was at a much lower weight, so the tuxedo and other dress clothes fit correctly and I actually didn't mind it. Family time was the main reason for the cruise. We did a lot of walking around, talking, and relaxing together. Used the rock climbing wall on the ship several times and it was nice being able to do that successfully. I definitely couldn't have done as well when I weighed 280 lbs. Also did the Flowrider on the final day. It was closed most of the cruise due to temperature, rain, wind, etc. On the final day the daughters and myself went bright and early and we had it all to ourselves for the first 20 minutes. And the next 20 minutes after that there were just a few others that showed up. We have a Flowrider here locally, but they only allow using the body board / kneeboard. The one on the ship also had small skim surfboards that you were allowed to stand up on. Bungee jump off the 150' bridge was insane! I've posted a link at the bottom of this post to the youtube video I took of my 13 year old daughter doing it after I went. I have video of my jump, but haven't taken the time to edit and upload it yet. I did a quick edit of hers so that she could show to her friends. I've done several other things that have given me adrenaline rushes and mild amounts of fear. There are times that my current dirt biking has some terrain that a mis-step could result in major bodily harm. I was into racing cars for a few years. I've gone parasailing, raced road motorcycles, jetskis, snowmobiles, etc. Have ridden pretty much every type of rollercoaster and fair attraction. Even got strapped into a bungee slingshot device that sent you around 100 feet in the air, but you were in a partially enclosed metal cage. None of it even comes close to the fear that I encountered during my bungee jump last week. For the bungee jump, I went first and then my daughter went. The bungee jump was definitely the scariest thing I've ever done in my life by far. I thought I was a "manly man" and didn't think I'd have any problem doing the jump. I found out differently when I arrived on site. In the past I've seen bungee jumping on TV, Youtube, etc. I remember watching contestants on The Amazing Race get to bungee jump obstacles and break down in tears because they were just too scared to do it. I always thought they were acting way too scared for something like that. I now fully understand the fear. The drive to the bungee jump bridge is one of the most beautiful drives I've ever taken. 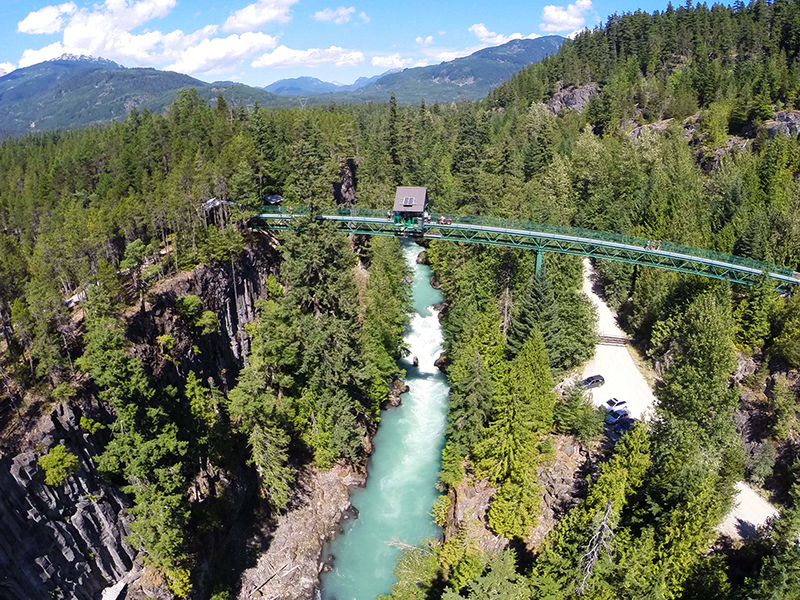 The jump was near Whistler, British Columbia (Canada) and the drive was along the west coast with high rugged mountains, ocean, and lots of green. I was suprised to see the amount of snow still on the tops of the mountains since it's right on the coast. We had a couple hour drive from the hotel to the jump bridge. It was a calm and relaxing drive and the girls were slipping in and out of sleep most of the way. Got to the bridge around 9:15am for the 10am jump. Arrived early so that I could setup video cameras on tripods at different vantage points. Still calm. Around 9:45am started the short trail walk up to the one end of the bridge. Still calm. Started crossing the bridge and around halfway across stopped to look over the side at the rushing river below. Instant anxiety, definitely NOT calm. I suddenly realized what a 150' drop really meant. All types of thoughts started shooting through my head. I started thinking that I really didn't need to do this anymore, that I'd be fine going the rest of my life without bungee jumping. Unlike my daughter, I hadn't told a ton of people that I was going to do this. My daughter had told just about everyone she knew that she was going bungee jumping for her 13th birthday. I encouraged her to do it, knowing that it would be harder for her to back out once she had told so many people. Back to me thoughts..... I knew if I chickened-out that my daughter wouldn't do it either. Part of me thought that it would be a relief to her also. While she has been nervously looking forward to the experience for the past month, seeing it in person was just terrifying. I decided to go sign the final release forms and get the harness on. Did it and was feeling calmer again. Came to my turn in line and I was still pretty calm. The guy that went before me was about 10 years older than me and it was his first jump too. When he was getting unattached after his jump, he was smiling but also mentioned how he had almost blacked-out during the jump. That gave me a little bit of anxiousness, but still relatively calm. Walked through the barrier area to the actual jump platform area and was told to stick the toes of my shoes over the edge of the platform. At this point any sense of calmness instantly left. I stepped out onto the platform and looked down. Huge amounts of fear like I've never experienced before! At this point my mind was having a major argument with itself. The logical side of the brain kept arguing that it was "safe", that the harness and attachments were checked multiple times by at least 3 different people, and that they've never had a fatality or major injury before. The other side of my brain was yelling ABORT, ABORT, THIS IS STUPID, YOU'RE ABOUT TO DIE, TURN AND RUN, GET OUT OF HERE, DON'T DO THIS, YOU'RE GOING TO BE THEIR FIRST FATALITY, THE HARNESS IS MADE FROM LITTLE BITS OF NYLON, ABORT, ABORT. Standing on the edge of the platform with a death grip on the railing I realized that I could NOT jump off forwards. I let the person know that I was turning around and was going to jump off backwards. She said ok and I turned around, still with a death grip on the railings. At that point I realized that I could NOT blindly fall backwards off this bridge towards the rushing river and jagged rocks below. I told here I changed my mind and was going to turn around and go face first afterall. She said ok and I turned around again, still having a death grip on the railings. She asked if I was ready. I wasn't, but said I was. She said to let go of the railings and lift my arms up to the sides. I did. She started a quick countdown....5..4..3..2..1.. And I jumped off the platform! Kept my eyes open the entire time and will always have the image of plummeting straight towards that rushing river burned into my memories. About 3 seconds of utter terror as you free fall with no resistance. Then the bungee kicks in and you start bouncing up and down a few times while the adrenaline rushes throughout your body and fills you with an extreme sense of euphoria. Then they pull you back up to the bridge. When I got back to the bridge I was shaking from experience as the adrenaline was still coursing through my veins for the next couple minutes. I had a huge smile and started encouraging my daughter for her jump. I told her that it was going to be the scariest 3 seconds of her life, but it would quickly be followed by the most awesome feeling she had ever felt before. As you can see in the Youtube video link below, she handled the initial jump much better than me. Progress as of today: 83.6 lbs lost so far, only 40.4 lbs to go! This is an amazing post. Could easily be an article on Fatherly. So much here I have to process and respond more later. Good job! Watched your daughters video...she is amazing!!! OMGosh what a video!!!! Thank you for sharing!!! AND also, thank you for sharing the whole thought process that you went through. Not only was that very interesting, e.g. whether to jump forward or fall back, but also very much appreciated, personally. Nice to see a couple entries from our Manof DD! Haha!! There’s always one…I miss the other guy from DD, OhioRaven! …as I run more I hope for it to cancel out any weight gain. I meant to get more into running this month but decided to take a class on Wednesaday evenings and despite it being a really easy class and fun class that actually gets out early most of the time, I haven’t had the energy to fit in cardio more than 1x a week even though my original plan this month was to do it 2x per week – class ends this week – so next couple months will be far easier to do it 2x per week – my goal is to once again jog one mile without stopping and possibly get up to 1.5-2mi. After that, I’ll be working on speed…I don’t care about distance increasing, but speed. And for now, the goal is just to do a mile – I’m far from the goal right now. Yes, rock climbing will not work if you aren’t fit! Too much weight for the upper body to have to lug up! So congrats to you !! I’m sure you were VERY happy about it. Never head of a flowrider…sounds fun like surfing! Good idea to get the videos of the bungee jumping! I went paragliding last fall I Colombia and wish I get either photos / video with it….would have been nice to look back on! When you come to NYC, you must go and ride the Cyclone rollercoaster located on Coney Island ! !....LOL, you felt euphoria on the bungee jump! I’d have felt FEAR only! It sounds ilke an experience of a lifetime…I don’t think I have a desire to ever bungee jump…but ziplining, I’m up for that again! Yesterday went mostly successful at being back to normal eating levels. Have to hit the road and get back to playing catchup with work. Will recap vacation when I get caught back up. Progress as of today: 90.5 lbs lost so far, only 33.5 lbs to go! Good luck with getting back on track -- you can do it!!! i'm proud of you, Gains! Great vacation...and now back to the healthy stuff. Welcome back! I missed your "momentum energy" on the board. Sounds like you are hitting the ground running like 007. Good job! Just updating my weight for now. Cruise was fun. Bungie jumping was the scariest thing I've ever done (almost chickened-out). Enjoyed family. Ate a ton and am ok with the resulting 20 lb gain on the scale. Have to get on a huge backlog of work, so will update in more detail over the next few days. Eating and drinking are back under control starting today. Progress as of today: 87.3 lbs lost so far, only 36.7 lbs to go! Welcome home, Gains! Sorry about the gain haha…but it seems it’s the direct result of what you knowingly did..now that your kids are out of school and activities hopefully have decreased, your stress will be less than it was at the end of the year when you had little time for anything and you were constantly driving from one activity to the next with your girls. Oh, and the bdays. Now, possibly there will be more time (just a little lol) to plan for better eating / or even buying and keeping some more veggies / fruits on hand at home. Just suggestions! I am also working to change some of my habits. I’m working to switch from ice cream to greek yogurt – but not sure how I’ll fill up on it…maybe I’ll just keep the ice cream, lol…but def learned to stop so much of my diet jello (makes my face break out horribly for some reason, always, as I eat many at a time). And also I have stopped my light whipped cream habit as it is bad fats in the whipped cream, completely not healthy to ingest a half a container at once – and it has the artificial sugars in the light/sugar free versions. Also for me, I’m back to refraining from sf energy drinks as they tend to drain me and also affect my skin possibly bc they are dehydrating. Just giving you some “fuel” to comment and write your opinions on when you come back again to join us in not too long from now hopefully ;) when you get caught up! I would be SO SCARED to bungee jump. I don’t think I’ll ever want to try it in my lifetime. Did it hurt at all, the jolting up and down of your body attached to the cord? I’m glad you look forward or at least have started to get back on track. Without another upcoming trip, I hope you will consider eating for life / eating in a way that’s something you can carry on for the long term. This is where I am at, still working to make better choices, for sure, but realizing that everyday is a chance to be a little better in the long term. I still struggle but like you know I find my ways. To me, it’s a lifestyle, for sure, not just another “diet.” So I don’t think of certain foods as being out or against the rules, it’s just about how I fit what I choose into the day. Many times, my choices are too processed or too much junk out of me opting to choose convenience /satisfaction/craving over health but it’s all a learning process ! Welcome home…I hope you get a chance to go out and pick up some healthy staples at the supermarket so you have options to reach for when you want to eat. Great to hear that the cruise was fun......welcome back! wow, way to go on the bungee jumping! I will never do that. Welcome back!!! So glad you had a good time! You were missed here, too! Hitting the road in about an hour. Driving to Seattle today, boarding the cruise ship to Alaska tomorrow. We purchased the cruise tickets almost 1 year ago, so we've been anticipating this for quite some time. Most of the family (my family, sister's family, grandparents) will be on the trip, approximately 16 of us. Foodwise, not sure how today is going to go with it being on the road all day. Ideally would like to stay away from overeating, but know that often falls by the wayside the second I feel like I'm on vacation. Progress as of today: 108.2 lbs lost so far, only 15.8 lbs to go! Bon voyage! I wish you a safe, happy, enjoyable vacation! Maybe just be mindful as you approach a meal or a snack. It doesn't have to be black-and-white, on-diet/off-diet. Aim for the best nutritional options. Have a great trip.....and relax and enjoy yourself! enjoy. try to enjoy the time with your wife and girls the most, over the food. perhaps show us some cool sights when you get back from your trip...a photo of you standing on a glacier or something ? something we don't see everyday! enjoy the cruise that you've waiting so long to go on. i agree with donkey about the black and white...try your best to enjoy all the cruise has to offer. try not to reprimand or punish yourself...enjoy it. Bon Voyage! We want to hear all about it when you get back! Waiting in line to board right now. Someone is in Alaska right now! Got sidetracked for a week. My mind and tummy wanted to start my cruise vacation a week early. Intended to only go off-plan for Memorial Day, but that extended to including my daughter's birthday, then camping in the mountains, then daughter's birthday with friends, then daughter's birthday with family. Scale shot up to 190, but got back under control the past few days and the scale dropped back down. Today is the last day in town. Have to get some work finished up, errands run, lawn mowed, etc. We leave for Seattle tomorrow morning after dropping the dog off at the pet boarding place. Should be boarding the ship to Alaska on Friday around 10am-noon. Ideally I'd like to stay in control of food intake today, tomorrow, and until dinner on Friday night. Today shouldn't be a problem, but I don't know about tomorrow. We'll be on the road for 10-12 hours and that's the time I usually stuff my face in an attempt to fight boredom. There is also Boehm's Chocolote Factory in Issaquah, WA. Since I was a little kid, we always stopped there and I've always got a freshly dipped ice cream on a stick with thick dark chocolate and fresh roasted nuts. I've told my daughters about it several times and am pretty sure we will be stopping there. I suppose that will be later in the day around dinner time. I guess my plan for traveling Friday will be to pack a ton of zero-calorie drinks for the trip and not eat anything until we get to the chocolate factory. Order ice cream things for the family and leave without getting talked into any other stuff (chocolates, fudge, nuts, etc). Alaskan cruise starts Friday and goes for a week. Ideally the plan is to skip breakfast / lunch and effectively stay OMAD. I don't know how possible that will be. It's my vacation. Part of me says "screw it" and I shouldn't worry what or when I eat. The other part of me reminds myself that I feel like crap the next day when I overeat and I really don't want to feel like crap for a week straight because I've overeatten for a week straight. So the plan is OMAD, the reality will be ????? Progress as of today: 104.4 lbs lost so far, only 19.6 lbs to go! OMG I'm so excited for you! I hope you enjoy your vacation without all the worries of forever dieting. You have worked very hard and enjoy a peaceful stress free vacation. I hope you see whales and all kinds of cool stuff! Hi Gains! ! ! So happy to see you drop by – it’s sad to lose DDers from our online community! I can understand how you got sidetracked with being off your plan the whole week because of all the bdays and celebrations. And I’m sure you had to do a lot of the driving and planning which requires energy and for me sometimes I’d indulge just due to the mental aspect of all the events and obligations. Remember how to get back…how you can order healthier options (when you feel like being back to that). Last night I went with a friend out to eat locally to a pizza shop and they have awesome sautéed mushrooms in olive oil with shaved slices of garlic. lol…my point was to you really here is that there’s ways to eat what you enjoy when you can find ways to work them into your diet so it’s a way of life. So far, I’m sure you can say you’ve learned a ton and experienced a lot and learned from what you’d like to continue and also the techniques that were worth trying but maybe not a long term method for you! Past couple days have been on plan. Went dirt biking for a good portion of Saturday. Having family over today for dinner. Wiring an outlet for the RV today. Going to take it out this next weekend for a couple days in the mountains to celebrate my youngest daughter's 13th birthday. Taking the dog with us and should get some hiking in. Not much else going on, although birthdays bring a lot extra stuff to the schedule. Will take treats to her youth group Wednesday night. Thursday will take treats, flowers, and balloon to school. After school will take her and a couple of her friends bowling, followed by dinner. Friday morning we'll leave to go camping. Probably come back Saturday. Sunday night the extended family is coming over for her family birthday dinner. Progress as of today: 107.8 lbs lost so far, only 16.2 lbs to go! What a cool birthday gift! I'm not sure I'd have the courage to try this, but just to be there would be an incredible view! Glad to hear you're staying on track. the view is soooo beautiful! sounds like your daughter is going to have a wonderful bday and family time!! Bungee jumping is super fun but even if there is no accident can result in whiplash and TBI. How exciting! My son bungee jumped, he loved it, but lost his wallet, so don't take that!! I always wanted to hang glide, maybe if I ever lose enough weight I will do this! ohhh you bad Gains! jk...it happens to us all!!! you shall be ok and we want to hear about vacation when it happens like what activities you did on vaca! Barely reigned-in myself yesterday, but did it and remained under calorie allotment. It all started when I woke up around 3am with ice cream sandwich on the brain. I'd bought a large multi-pack the day before at the store for the girls and had avoided them initially. In their place I decided to try the Halo Top ice cream pints and actually kept myself to only eating 1/2 pint initially. Well at 3am yesterday I ate 1 of the ice cream sandwiches. Then ate the 2nd half of the Halo Top. Then decided to eat a 2nd ice cream sandwich. Then a piece of string cheese. I knew I was spiralling out of control and went back to bed. Woke up and ate a couple more things, including the last ice cream sandwich (my 3rd). Ate a couple more things in the morning hours and finished with a large salad around 1pm. So at 1pm I was sitting at exactly my allowed calorie count for the day. I fully intended to go off the deep end and have a major cheat day, but knew that I had a choice and at that point hadn't thrown the day away yet. So I drank a boatload of zero calorie drinks through the rest of the day and didn't eat anything else. Feel much better about myself today than if I would've kept eating. If I don't have temptations in the house, it's a lot easier to stay on plan. I won't usually drive to the store to buy junk I'm craving, but if it's just sitting there within 20 feet of me that's a different story. Oh well, dodged a bullet yesterday and feeling in control today. Progress as of today: 106.5 lbs lost so far, only 17.5 lbs to go! same with me...and i do keep lots of temptations out of my place too. The halo tops are so low cal that a whole pint probably equals one ice cream sandwich. so when you are feeling snacky, eating a whole pint will NOT break the calorie bank, AT ALL :) when i eat a whole pint, i tend to start to shiver after eating such cold stuff lol. in the winter, i'd have to shower after to get warm haha. anyways, even eating TWO pints in one day if you are struggling, would equal only two ice cream sandwiches, approx. the older i get, the more healthy and ligher options i have at home, the more i learn, the easier it has become for me to NOT go off the deep end. yes, i'm always tempted to eat more than i plan...but when i am doing that, it's far better than my earlier days in my mid 20's the time i regained all the weight i lost from my 1st weight loss (and only weight loss). In those days in my mid 20's when i was changing careers and going back to school, i stopped the gym, and i would totally have days where i'd also drive from drive-thru to drive-thru with the fries/milkshakes etc....and also the nights of waking up and bingeing. I've gotten better with all of it - with practice and also with having better options and also with eating more fulfilling things during the day so that my body doesn't feel so deprived or wake up in the middle of the night. so you accomplished a lot by getting the temptation and habit of overeating back under control - always realize that it's not your last time to enjoy these types of foods...that you can have them...and even better, knowing you have options (halo top) that has more fiber i believe and is more filling...and a bigger volume. and to me, it's just as good as an ice cream bar...so i don't feel deprived, at all, when eating what i buy instead of ice cream regular brands for instance.. It was my first time trying Halo Top since I've heard several people mention it over the past bit. I doubt I'll be buying it again. It tasted ok, but instead of filling a desire, it really just got me craving more sweets. Better for me to just avoid it for now. also, perhaps no more ice cream bars in the house...perhaps you can buy halo for all? although, i am aware it is $$$$$$$$$. for myself living alone, i do eat it frequently and it's the ONLY brand i buy besides the other low cal brand, Enlightened. In the future I just need to drive the family to Dairy Queen or McDonalds when I feel like "treating" them. That was my plan a couple days ago, but then did the math and decided to get a giant box of ice cream sandwiches from the big box store because it was a better "bargain". Next time, no Halo Top, no box of bargain treats. Will go to a place and eat a single serving and go home without any further temptations sitting there in the house. Royal Caribbean has great food options, healthy also if you don't order like 2 dinners every night lol. I've been on that line with my parents also as a teen and young 20's adult, to Caribbean islands. I'm glad you'll be getting off the ship..otherwise, it's such a waste when you don't see everything there is to experience and enjoy on the island! Let us know how the weather is in Alaska and if you get to climb / walk on glaciers! On a cruise, you don't necessarily have to gain tons of weight...if you watch the quantities of the totally unhealthy things you eat and make good use of all the healthy tasty options available. If i were going on a cruise, i'd try to even have the waiter bring a full plate of veggies to the dinner table each night as a side dish! oh yea! but yes, enjoy the food on the cruise as Royal Caribbean is known to be great. On contrast, i went on one cruise in my late 20's think i was 20 with a friend on Carnival - i can tell you, the food was totally not up to par or near the same quality as Royal Caribbean. like, NO MATCH whatsoever. The wife and I did a cruise to the caribbean about 13 years ago on Carnival and had fun. We did this same Alaskan cruise about 5 years ago with a couple of friends. The ports are one that we've already been to and the activities there don't really interest me. This cruise is mainly just to get the entire extended family all together like a family reunion type thing. We chose Alaska so that everyone could save some money by being able to drive to Seattle to board the ship (we all live in the NW). I know that I'm going to eat more daily than I am currently. My current plan is to eat whatever I want, but only at the nightly formal dinners. My thought is just to continue OMAD and not worry about what foods I eat for that week. It's the grazing / snacking ALL day that tends to be my Achilles heel. i did like carnival, just the food wasn't tops. :) have a good day! We have found that regular fudgesicyles(sp) do the trick....they don't tempt me too uch.....but D likes them...and they are low cal for some reason...don't ev3en have to buy the sugar free. It took me a LONG time to get to the point where I can have certain foods in the house and not go overboard. For years, I could not have potato chips anywhere in the house. i hope you are having a great weekend, i've been away from DD a bit too! Staying on-track as far as daily calorie restriction. Need to get caught up on work today and tomorrow. Going on a dirt biking trip all day Saturday. Kids are winding up the end of school. 14 DUC's - we start the driving portion of the trip in 2 weeks (1 day drive to port). Progress as of today: 105.8 lbs lost so far, only 18.2 lbs to go! Yes, it's a completely new experience for my daughters, so they're really excited about it. 2 weeks till cruise! yay...what ports will it be docking at??? i'm intrigued! and how long is the entire cruise? oh, and what cruise line? One of our daughters is done tomorrow and the other has a few days next week. Both start after Labor Day. The cruise is to Alaska and the stops are Juneau, Skagway, Tracy Arm Fjord, and Victoria British Columbia. The wife and I have been on it before, so I don't really care about the ports. This cruise is mostly for my daughters and our entire extended family that is going (grandparents, sister's 9 member family). Royal Caribbean and it's a 7 day. I'll probably be hiding after day 3 because that's about my tolerance level for anyone other than my wife and daughters. They'll have a good time with the entire experience. I'll enjoy seeing them experience stuff and I'll also enjoy the food. Sounds very nice! Do you plan to stay on board when the ship docks at the ports? My boss is really big on cruises and he likes to do that sometimes, just to enjoy without so many other people around. I hadn't thought about staying on board before while at a port. I'm expecting to get off the boat each time and spend the day with my family. I get joy out of watching my daughters experience new things and watching their eyes light up. They both have positive attitudes, are happy, still exude child-like wonder at things, and are just enjoyable to be around. By contrast, one of my nephews is the stereo-typical sarcastic, negative type that just tends to bring everyone down (not looking forward to that). It's a big boat, so other than nightly dinner, I may try to avoid him as much as possible. Yesterday was successful as far as OMAD and counting calories. Wasn't feeling good when softball time came around. Showed up just in case they were short on players. They had enough, so I bowed out for the night. Today is a dental cleaning and trying to get caught up on work. Don't know which I dislike more. Progress as of today: 107.2 lbs lost so far, only 16.8 lbs to go! Dentist vs Work = I dislike whatever takes longer to do. haha. It's good you showed up as a team player despite not feeling well. Very considerate of you! Nice job yesterday with balancing your calories with other wants and desires. nice job! recently i notice that i keep messing with eating slightly higher than my limit, so now i'm in my head trying to make the limit lower with cals a hair so that if i break it, cals are still good...if you know what i mean! lol. i guess i am resisting my limits! but i want to be more like you...so i am imposing a lower limit! oh, and just about 2 weeks left! good job! But you'll have great teeth to smile with in those cruise photos!!! I'll take the dentist. I don't feel like eating after the dentist.